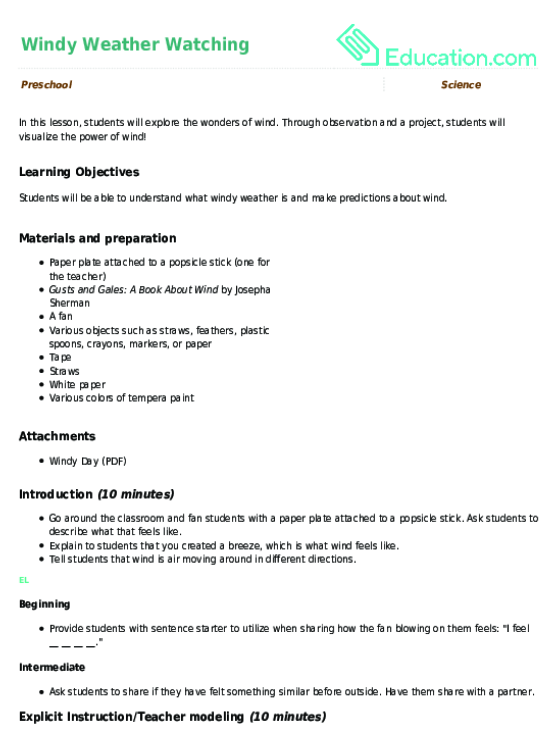 This lesson can be used as a pre-lesson for the Windy Weather Watching lesson plan. Various objects such as straws, feathers, marbles, blocks, pencils, tissue paper, etc. Students will be able to describe windy weather and make predictions about wind. Students will be able to make and check a prediction about weather using tactile supports and sentence frames. 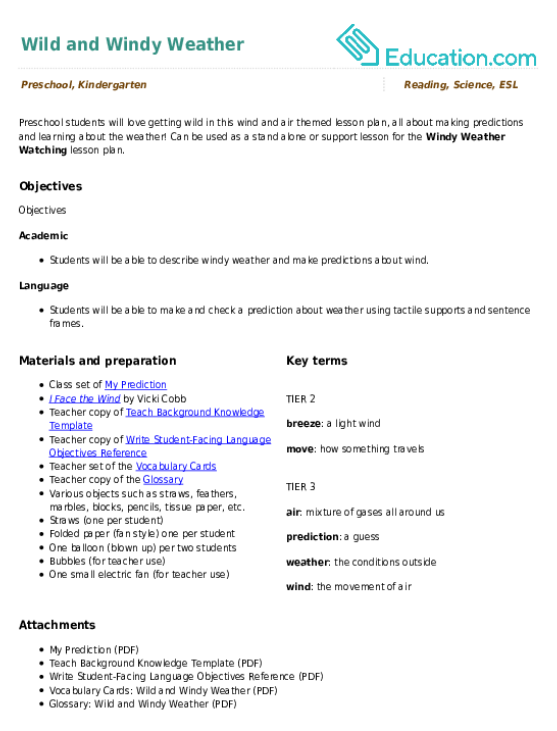 Prior to the start of the lesson create a class KWL anchor chart with three columns labeled "Know", "Wonder", and "Learn." 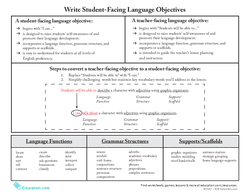 Gather students together for the start of the lesson. Turn on your small fan and blow some bubbles. Ask students to turn and talk to a partner to share what they see the bubbles doing using the sentence starter, "I see the bubbles __ __ __ __." Explain the bubbles are moving because the air from the fan is blowing them. When this happens outside it is called wind. Tell the class that today they will be learning all about wind. Ask students to think about what they already know about wind. Have students share aloud using the sentence starter, "I know __ __ __ __." 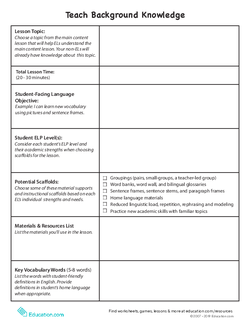 Record their ideas under the K column of your KWL chart. Then, ask students what they wonder of would like to learn about the wind. Record these ideas under the W column on the chart. Read aloud I Face the Wind by Vicki Cobb. Pause as you read to introduce and/or clarify new vocabulary words (using the vocabulary cards and glossary as needed). Demonstrate the materials and model how you can make a prediction about what happens to each material when it is blown by the wind. Model blowing through a straw and using a paper fan to simulate the wind. Provide the sentence frame, "I predict that the __ __ __ __ will __ __ __ __ when it is blown by the wind." For example, "I predict that the marble will roll when it is blown by the wind." Ask students to choose one of the materials and turn and share their prediction with a partner. 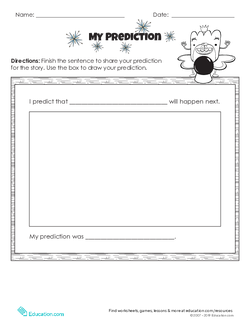 Pass out the worksheet and have students draw or write their predictions. Review any material expectations and model how students can choose their materials to experiment with wind (using their straws and fans to mimic the wind). Display the materials and describe each of the objects as you pass them out, (e.g., the feather is light, the marble is round, etc). Pair students together and pass out materials (one straw and fan per student, one balloon per pair) and allow students to explore the materials. As students are exploring materials, ask students to share with their partners if their predictions were correct or not. Provide fewer materials for students to explore. Have students work in a small group of three to four students with a teacher to support them to make and check their predictions. Have students make a new set of predictions for a different material. Encourage students to share their predictions and reasoning with a partner. Assess if students are able to accurately make a prediction and determine if their prediction was correct by listening to students share their predictions aloud. Check their drawn/written predictions. As students are exploring the materials, ask guiding questions such as "What happens to the balloon when it is blown by the straw? Will the feather or pencil move farther? Why/why not?" Gather the class back together and ask them to share what they learned about wind. Provide students with the sentence frame, "I learned __ __ __ __ about wind." Record their thinking on the anchor chart. As time allows, have students share their favorite part of the lesson. 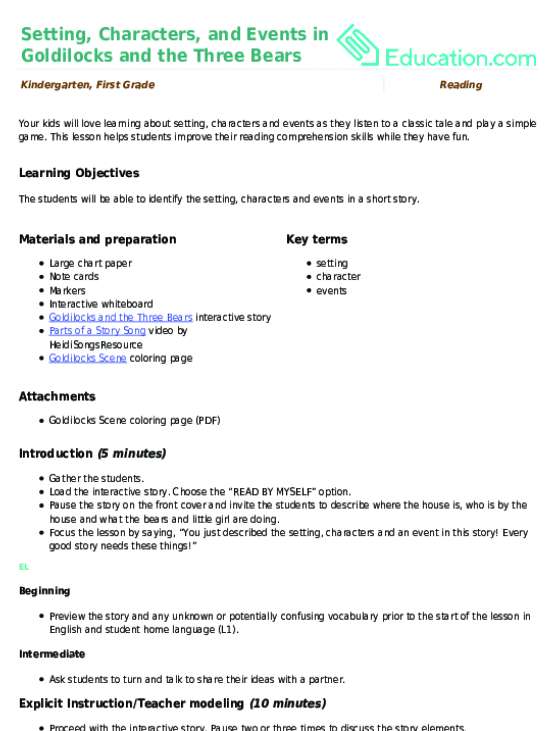 Use this glossary with the lesson plan EL Support Lesson: Wild and Windy Weather. 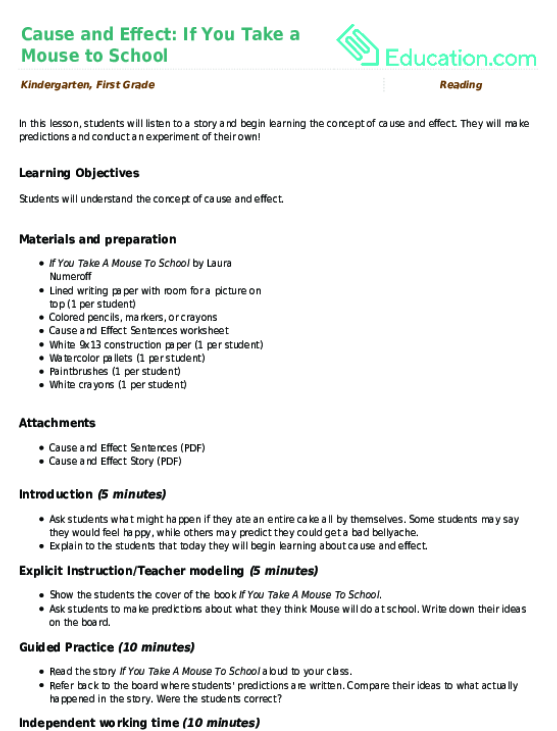 Use these vocabulary cards with the lesson plan EL Support Lesson: Wild and Windy Weather. Preschool students will love getting wild in this wind and air themed lesson plan, all about making predictions and learning about the weather! Through observation and a project, students will visualize the power of wind! 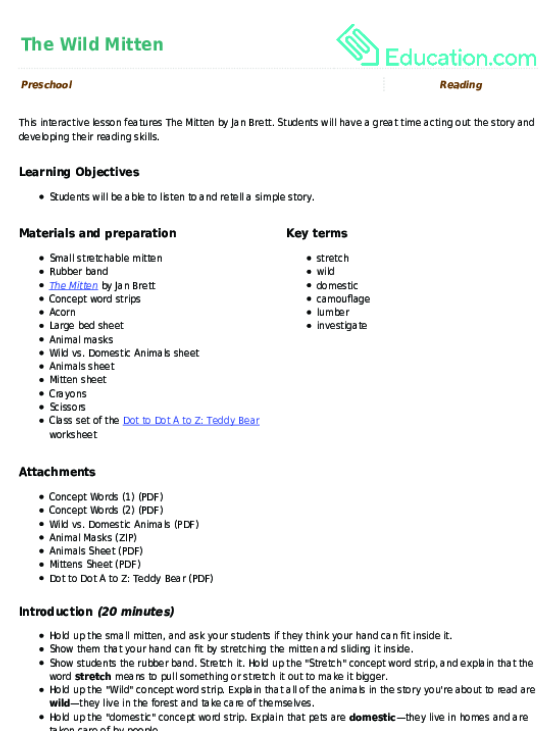 Students will have a great time acting out the story and developing their reading skills. Your kids will love learning about setting, characters and events as they listen to a classic tale and play a simple game. In this lesson, students will listen to a story and begin learning the concept of cause and effect. They will make predictions and conduct an experiment of their own! 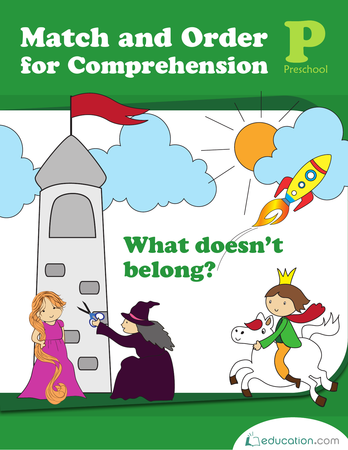 Use this handy worksheet to help your kindergarten students make connections between the illustrations in a fiction text to the story. 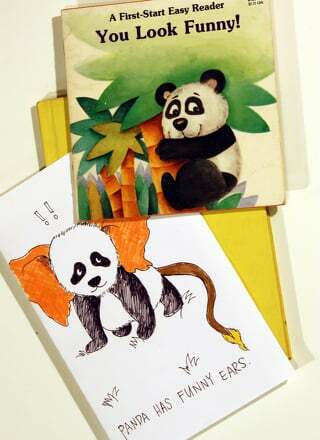 In this activity, she'll listen to a story without looking at the images, and create her own.